Streamline - Timeline Television Ltd. 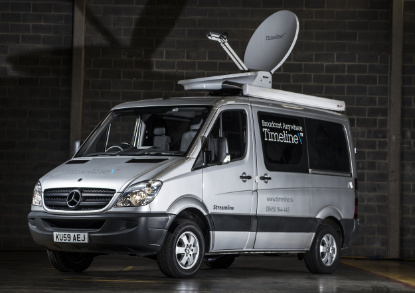 Streamline is an ultra-compact outside broadcast truck that delivers live programmes from any location with full broadcast features including a built in up-link. Streamline handles multiple HD signals with its powerful ‘Tricaster’ 8000 vision mixer providing full camera coverage at any venue. The integrated Ka-band satellite link, coupled with top-of-the-range H264 encoding, delivers high-quality pictures. The truck is equipped with a Newtek 3Play 425 six – channel slow motion replay unit allowing recording of four sources with two simultaneous replay outputs. Streamline is perfect for live sports reporting, feature inserts or corporate events. Operational positions for Director, PA, Sound Supervisor, Engineer and VT Operator.